Back in the summer of 1996, there were only three things you could find me doing. Watching scary movies with my best friend when no one was home and scaring the heck out of ourselves, baking in the sun on back decks and in the front yard all while hoping the neighbors would ask if we wanted to come swim and blasting Strawberry Wine on repeat even though I kinda barely knew what it meant but at the same time wanted it to be my life. Here’s something I wasn’t doing in 1996: eating asparagus. I don’t even know if I knew it existed and if I did, I sure as heck was ignoring those scary green spears. Every time I make asparagus like this, I just want to shout “did I shave my asparagus for this!” Because yes I did. I even once titled a recipe after that album/song. I didn’t like country music until way later, but when I was in eighth grade, I’d listen to any song sang by the person who created Strawberry Wine. I think I even wrote short stories with the same subject content. If not, PIZZA. Now you know what I’m talking about right? Pizza is a lover. I’m also adding once-a-week grilled pizza night to my summer bucket list. If you feel like performing a tedious task, shave your asparagus into pretty little ribbons. It is quite the feat and requires a bit of patience, but I really love it. 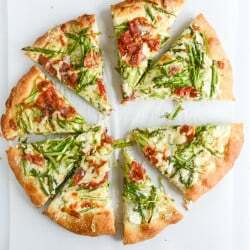 If you’re not feeling it, chop your asparagus and add it to pizza. Same thing. Kinda maybe sorta. All the other things on this pizza are what make it a lovely whole. So. Whipping ricotta is by far my favorite way to prepare the cheese. 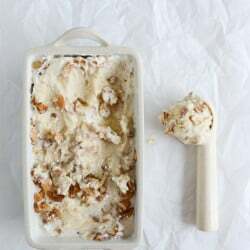 I don’t love it as much as whipped feta – there is no beating that tangy, delightful spread – but since I’m rather iffy on the texture of ricotta by itself, pureeing it until creamy is the only way to go. And spreading it on pizza. And covering it with additional cheeeeese. Plus, if you’ve been reading for a while then you know that ricotta is a food that my husband claims to hate even though I’ve tricked him into eating it countless times. Whipping it makes the trickery easier. Wife tricks. I love to top this pizza off with a sharp cheese for extra flavor, but also a few slices of prosciutto – which get perfectly crispy in the oven and are reminiscent of huge slices of bacon. To shave the asparagus spears, take a vegetable peeler and run it along the sides of the asparagus. I shave off as much as I can and leave the tops whole, adding it all to a large bowl. Add the ricotta to a food processor and blend until completely whipped and pureed. Add in the garlic, salt and pepper and blend again until combined. Brush the pizza dough with the olive oil. Spread the whipped ricotta evenly on top, then cover with the grated cheese. Add the asparagus on next and space out the prosciutto slices. Bake the pizza for 35 minutes (baking sheet) or 15 minutes (pizza stone). Remove and cover with a sprinkling of parmigiano reggiano. Let sit for a few minutes before slicing. and lots of vegetables here too! This was YUM! i made it last night for the in laws to be and the finace and they all loved it. You even got us to eat asparagus! Pingback: Nyårsguiden – kläder, mat, drinkar, pynt och lekar | Elsa Billgrens blogg på ELLE.se!